Seamless audio and visual integration add a finished quality to high-end interior design. Our interior designers in Denver, CO work to integrate electronics and sound systems into the the design decor of your space. Wires and cords are tucked behind walls and controlled by the touch of a button hiding distracting and messy cables. Easy to use touch screen controls and mobile compatibility create a dominion of comfort and convenience. Incorporating a home theater into a space requires specific shape and accommodations for desired seating placement, fenestration and light control, projector and screen size, acoustical requirements, sound isolation, and more. Our designers transform high tech rooms into beautiful and functional spaces. Adding audio and video electronics to a space is a challenge, however, the designers at Viridis Design Studio have worked with many clients to enhance their space with new, high-end technology for a modern audio visual integration aesthetic. 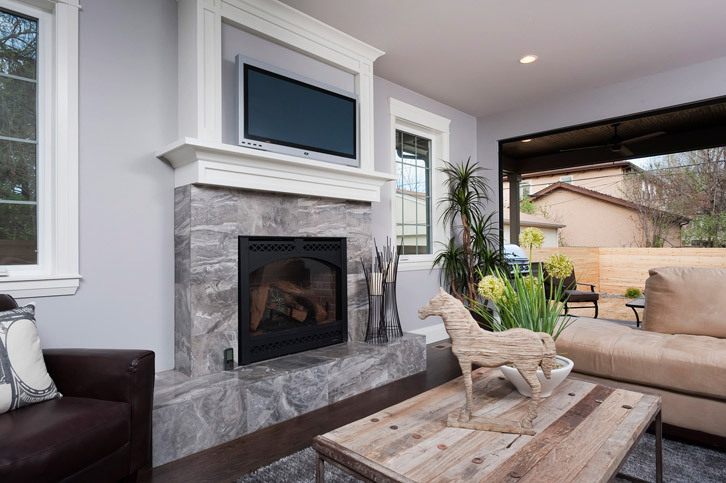 At this transitional-style home, the flat screen TV was mounted above the fireplace. Cords were hidden from sight and controls accessed from an iPad as well as the homeowner’s phone. For a consultation or to discuss your next project, contact Viridis Design Studio by phone at (303) 489-9958 or through our online contact form. We conduct our business with the highest professional standards, attention to detail, and quality control through every project milestone.